Governor Charlie Baker provided a press update Sept. 21 following the gas explosions in the Merrimack Valley. 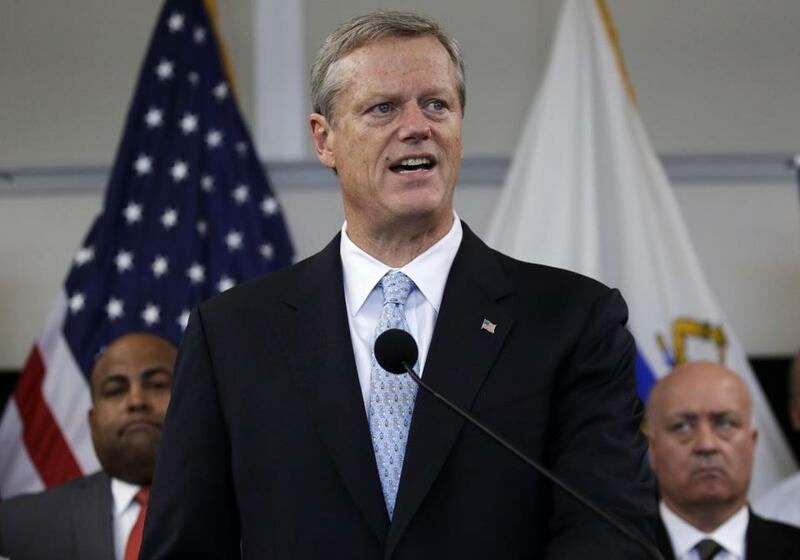 In the weeks after Governor Charlie Baker tapped Eversource to lead restoration efforts for a series of gas explosions in the Merrimack Valley, executives at the Fortune 500 company poured thousands of dollars into his reelection campaign, state records show. In all, a dozen Eversource officials, including its chief executive and top financial officer, plus several of their spouses donated $12,850 to Baker in the last two weeks of September, according to a campaign finance report the Republican filed with the state Monday. Baker had turned to the company on Sept. 14, a day after gas explosions rocked Lawrence, Andover, and North Andover, injuring more than 20 people and killing a Lawrence man. Baker had authorized the Department of Utilities to put Eversource in charge of the restoration effort amid a state of emergency and dissatisfaction with the initial response from Columbia Gas. Baker aides emphasized Monday that Eversource no longer has a direct role in the restoration effort, and a company spokeswoman said the donations didn’t have any link to Baker’s decision to turn to it amid the high-profile disaster. Baker had originally opted for the company, according to his office, because there are only two utilities in the state with large-scale “emergency response operations” that could handle the scope of the effort, and the other — National Grid — has locked out 1,250 union workers for months amid a fierce contract dispute. Eversource, Baker’s office said, was removed from the effort on Sept. 21, the day Joseph Albanese, a retired Navy captain, was installed as the project’s chief recovery officer. That’s the same day a pair of Eversource officials first donated to Baker, with the bulk coming a week later from executives including James J. Judge, Eversource’s president and CEO; Philip Lembo, the company’s chief financial officer; and Gregory Butler, its general counsel. Each gave the Republican $1,000 — the maximum allowable under state law. Margaret Morton, an Eversource lobbyist who made $141,535 last year for pushing the company’s interests on Beacon Hill, donated $200, the maximum for legislative agents. Baker’s “focus remains on working with stakeholders to help impacted residents and communities recover as quickly as possible,” he said. The contributions come at a crucial time for Baker, who is facing a challenge from Democratic nominee Jay Gonzalez in the Nov. 6 election. As of Monday, Baker had $4.9 million in his war chest, and he raised more than $274,545 in the final two weeks of September, continuing what’s been an aggressive fund-raising effort since he was first elected. That’s included donations from Eversource officials before, including Judge and Butler, who each gave Baker the maximum allowable donations in 2015 and 2016, according to finance records. Before the most recent surge, Eversource officials — some of whom self-identified in campaign finance records as working for Northeast Utilities, its previous name — had given $28,510 since he took office in 2015, though just $2,710 had come since the start of 2017. The names of individual donors to Baker’s running mate, Lieutenant Governor Karyn Polito, for the same two-week time period were not available as of Monday evening. The recovery effort has been a massive project. Baker turned to the National Guard to assist, and officials have set a timeline of restoring gas service to some 8,600 customers by Nov. 19. Hundreds of businesses were left without power, and efforts to pass out space heaters to residents hit a snag last week after inspectors found many homes had outdated and underpowered electrical systems. Baker said Monday that 190 crews were working on 48 miles of pipe to restore gas service to the three communities. Reach Matt Stout at matt.stout@globe.com.